Printed Calendar is another qualitative range of calendars offered by Nine Line Offsets. 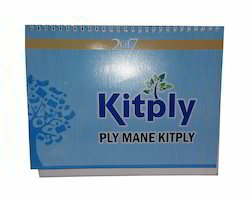 These Printed Calendar are high resolution printed calendars that hold a wide demand in the market. We offer these calendars in elegant designs that hold the attention of the viewers. In order to provide maximum satisfaction to our clients, we manufacture these Desk Calendar using paper of the highest grade. Being one of the leading manufacturers, we provide this product in several specifications, depending on the requirement of the clients. Designed by some of our experienced designers, the offered product is highly praised in the market. Our company is leading organization of this industry engaged in offering wide range of Table-Calender to our important clients. They have high in quality and superior in performance. We carry our detailed processing to make our products range and make them perfect in every aspect. Our offered product range including Table-Calender gives the long service life to the user and available at feasible prices. We believe in customer satisfaction so we finely processed our products range and offer it in affordable prices to our customers.